Once upon a time there were two holistic healthcare practitioners. They met, they discussed nutrition and medical nerd-science, they hiked, laughed, and (you guessed it) fell madly in love. She traveled the world, working mostly in Asia as a practitioner of Traditional Chinese Medicine--giving herbal therapies, acupuncture, and nutrition counseling as a private consultant. He had grown deep roots in his community, providing individualized integrative massage and bodywork therapies to his regular and dedicated local clientele. After some time of daily Skype sessions across the world for months at a time, a new opportunity arose. 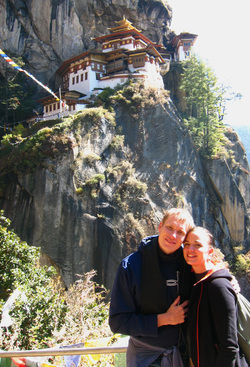 She was offered a position working in the high Himalayan kingdom of Bhutan, but knew she couldn't go without him. So he was offered a position too. elsewhere in the United States, or as a fellow citizen of Earth. Our experiences abroad have made us aware of just how small the world actually is. We are all the same, have the same concerns, the same joys, and are part of one big family. We humbly hope that we can help cultivate Radiance in your life, either in the office in person or through some of the resources on our website.